THE B-MOVIE NEWS VAULT: STOCK YOUR VAULT: New DVDs & Blu-rays for 03/21/2017! STOCK YOUR VAULT: New DVDs & Blu-rays for 03/21/2017! Greetings Vault Dwellers and welcome to SPRING! To celebrate the change in seasons, your favorite genre labels have released some awesome titles onto DVD and Blu-ray this week! Kino Lorber once again leads the pack with four new releases, including TEEN WITCH (making its Blu-ray debut), INVISIBLE GHOST (starring Bela Lugosi), CHAMBER OF HORRORS, and 1945's GAME OF DEATH! 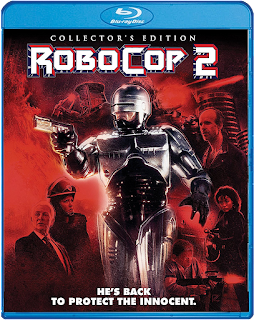 Scream Factory also comes out of the gate strong with EVOLUTION and Collector's Editions of ROBOCOP 2 and ROBOCOP 3, Olive Films gives us WON TON TON: THE DOG WHO SAVED HOLLYWOOD and BLAST-OFF, and Arrow Video has now released DEATH WALKS AT MIDNIGHT and DEATH WALKS ON HIGH HEELS separately! Lastly, SRS Cinema has put four of their low-budget offerings out on DVD and Blu-ray including Limited Edition releases of SHE KILLS and CANNIBAL MESSIAH, as well as Blu-rays of THE SNUFF TAPE ANTHOLOGY and SPACE PSYCHOS! Yes, there's a little something for everybody this week, so be sure to scroll down to view this week's impressive roster of new DVDs & Blu-ray discs!